I needed to make a thank you card and thought I would use my stamp set Casual Expressions. I cut a whole page of 1 1/4 inch ovals and a whole page of 1 1/2 inch ovals for a shadow using my Artiste Cartridge. I put them in the pouch with the stamp set to use for next time. A few of the stamps use this size and shape. I thought I would keep it simple so I could easily make more as needed. To show our support of Red Cross relief efforts for those areas of the US severely affected by Hurricane Sandy, Close To My Heart will donate $1 for every Stamp of the Month set sold as a part of this promotion during November. In November, you’ll get something extra when you buy the Stamp of the Month—50% off another stamp set! When you qualify for and buy the November Stamp of the Month set, Capture the Date, you’ll receive another stamp set* of your choice for 50% off—it’s like two promotions in one! The versatile Capture the Date stamp set is great for any layout, card, invitation, or calendar, and now you can choose another stamp set (like the ones I will be highlighting all month!) at half-off for more wonderful papercrafting. Get Capture the Date and then capture the savings today! 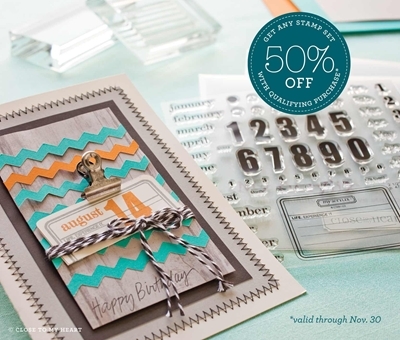 * Offer valid for A-E and M size stamp sets only; K-size, Workshops on the Go®, Cricut® collection, and Stamp of the Month stamp sets are not eligible for this promotion. Maximum of one 50% off stamp set per order.